I bought this to replace another soap dispenser. I really like that it doesn't use batteries . Nice design and works great! I have found a new talent in the kitchen and this makes life truly simple. I would definitely recommend this product. Only wish I could turn down the the soap plop a little more. To adjust the soap volume simply press the + or - buttons. To increase the amount of soap you will need to press and release the + button until satisfied with the amount. To decrease the amount of soap you will need to press and release the - button until you are satisfied with the amount. Please note, when turning the soap pump off and then back on, the volume will reset to the highest volume setting. I do LOVE this soap dispenser! This is the second one for us, this one is in a bathroom and we have the 11 fl.oz. model for the kitchen. It works precisely as described, charges easily, and holds the charge for months! Your wet, dirty hands NEVER touch the pump when using, and it helps to keep me and my sinks clean. This will be my go-to gift for the holidays for friends and family. Every home should have at least one! Thanks. I have two battery operated sensor pumps that I have used for a few years. One in the kitchen is perfect, keeping hands clean while dealing with raw meats and anything sticky. The other is in the half bath as you come in from the garage. This works great for my husband when he is working on messy projects. So when we decided to remodel our master bath, I started to look for another sensor pump. I was thrilled to find this rechargeable sensor pump. The ONLY thing I didn't care for on my older sensor pumps, was having to change the batteries...I don't have to worry about that anymore. This soap pump is BEAUTIFUL and it matches the new faucets. I do recommend buying the SimpleHuman hand soap. It works great with these pumps, last a long time and a great price. enfin un distributeur à capteur digne de ce nom !! design élégant et raffiné et aussi distributeur efficace. Fait des envieux ! Ich bin Rollstuhlfahrer und komme nicht immer direkt an den Standort eines Seifenspenders. Durch den Sensorspender kann ich immer an die Seife kommen. Die Handhabung und die Qualität des Spenders sind sehr Gut!! My son gave me one for Christmas because I liked his so much. Very disappointed when it stopped working after only a few months and wouldn't recharge. Returned it and it was replaced but resented that the comment was I shouldn't get it wet when I was very careful and didn't do anything to cause the problem. Glad it is back and am enjoying hands free soap in the kitchen again. For such a great product, the instructions about how to use it are abysmal. Once I got there, I was happy. Thank you for your feedback. I apologize if there was any confusion with the instructions. Feel free to call us at 877-988-7770 8am-5pm PST M-F should you ever need help with any of our products! We love our rechargeable soap dispenser. We had it for a couple of years and it had a little malfunction. It would randomly dispense soap. It was funny and weird. I emailed the company and they gave me advice on fixing it but it still didn't work. They had me send it to them, free shipping, and then sent me a new one. This thing looks great by my sink and is extremely useful. I will not be without one. My first rechargeable sensor soap pump was given as a gift. I loved it so much that I purchased two more. I love that it recharges so quickly. They are a bit pricey but well made. Would recommend. We received my first pump as a gift for Christmas 2015. Liking it so well we purchased another for 2nd use. From it initial charge, the indicator light blinked as it should. On later checking the light did not show when it should have been solid green??? We used it until it showed that charge was necessary. The unit did not show the green light blinking and would not charge. We then received another as a gift and it worked fine. We returned the failed unit to simplehuman and it was determined there was a problem that could not be repaired. The company sent us a new unit that charged properly. I would recommend anyone purchase this device as the company stands behind it's product. I bought a pump and in about 8 months it quite pumping. I wrote Simple Human and they emailed me some helpful hints bat that didn't work. I contacted them again and was told to return the pump for company tech help. A coup[le weeks alter I was told the contacts on the recharge plug was rusty and a new pump was being sent. On receipt I inspected the new pump and pointed out what I think may be a bit of a design flaw in this model. The black port cover opens by pulling downward. The top of the black port cover has a slight inward indention for one’s fingernail to flip open the port. This inward indention creates a small reservoir that tends to catch and hold water especially if the pump is touched by wet hands. In my humble opinion if the black port cover opened by flipping it upward the reservoir would actually face downward and drain rather than collect water. I was very impressed that Simple Human answered my query and stuck with me until the issue was resolved. Again thanks for your prompt attention to my issue. I love the convenience of this dispenser! We use it for dish soap at the sink and it is great! I also like how you can adjust the amount of soap dispensed so we don't have to use too much! Great addition to our kitchen! Only issue we had was the water leaked into the USB charger port. It was within warranty and simple human gave me a shipping label to return and determine why it wasn't holding the charge. Once they figured it out, they sent a brand new one. Overall, great product and great customer service. We love our rechargeable sensor pump and are planning on buying three more. works great, rarely ever have to charge it. 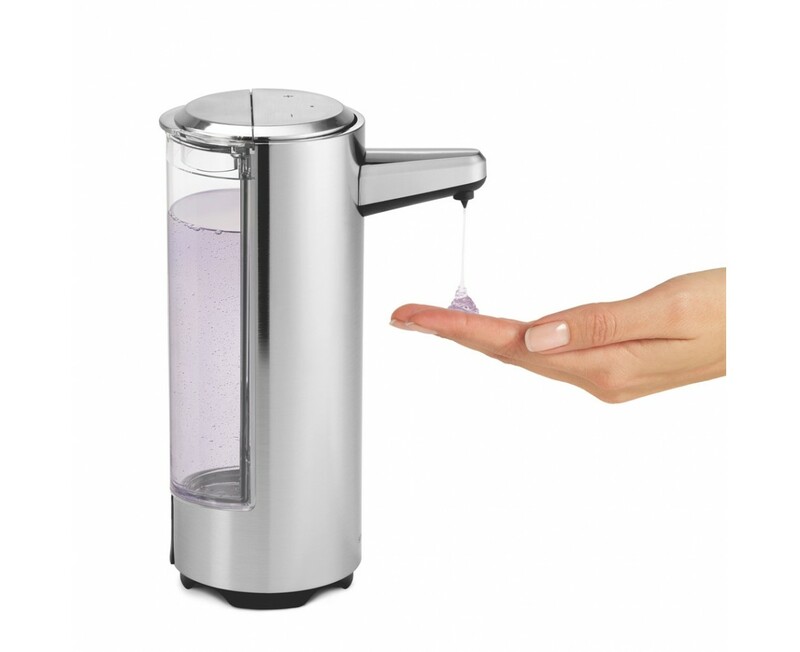 I got this to replace an old model Simplehuman soap dispenser. I hope it is as good ... although I bought six for gifts that year and mine was the last one working ... so I probably hope it is better. At least I won't go through so dang many batteries. So far so good. Have purchased two other pumps that were much cheaper, but neither has lasted longer than a couple of months. Invested more to get this pump after reading the positive reviews. The 2 year replacement guarantee is the reason I went with this pump. Plan on keeping an eye on this product to see if it does in fact meet it's prior reviews. I bought two of these for my kitchen, a brushed nickel model and a white model. I like the product a lot but had some trouble with the white model. The sensor quit working. The pump still worked if pushed the button. I sent it back an it was replaced with no problem. The replacement works but the battery life is shorter and it needs frequent recharging. Each pump worked only a few weeks to a month. Electrical area gets affected by moisture and stops pumping. We're so sorry to hear this. A customer support manager has been in touch to provide further assistance. Very well designed, engineered, and executed. Makes for a reliable dependable product. We own seven! (four nickel, three white. I received the sensor pump as a gift and it instantly became my main soap dispenser in the kitchen, used multiple times daily. It is very nice, very simple, and very useful. It puts out enough soap for each use. I did have an issue with it, it seemed that the seal around the USB recharging connector was bad and soap and water leaked into it corroding the connector. A very easy call to Simple Human's customer support to do a warranty replacement is all it took. However, instead of just sending me a replacement, they needed to evaluate it for a week. Once they determined it was defective, they immediately sent me a new unit which works great, no issues so far! I'll definitely buy additional units for around the house. I have two of these one 8 oz and one 11 oz. Have had the 11 oz for around a year. They are easy to fill with the pop up opening at the top, easy to change the amount of soap that comes out with the +/- buttons on the top. Much better placement than the last Simplehuman sensor soap dispenser I owned. Stainless steel is finger print resistant too. Bulb at top flashes red when charging is needed and takes around an hour on my charging station -- much easier than turning the thing over to change batteries like my previous model. I use the 8 oz in my powder room with the Simplehuman moisturizing liquid soap, and the 11 oz in my kitchen with Greenworks liquid soap. Have never had a clog using the Greenworks soap. This is the second pump I have owned. The first one stopped working and had to be returned. 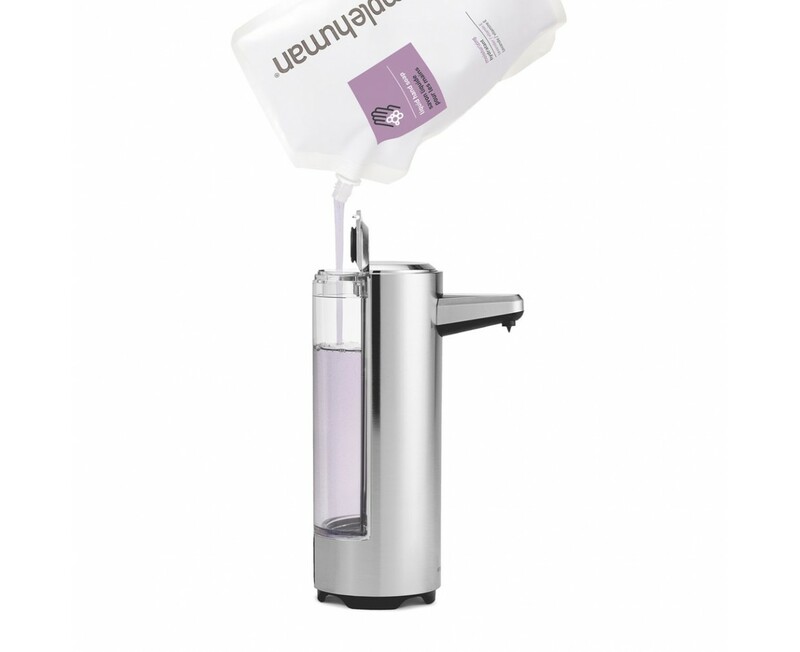 Simplehuman staff were courteous and very responsive, and after determining the problem with the original pump could not be corrected a replacement was sent. No problems so far with the new one, although the pump makes a little grinding noise when activated, whereas the first one did not (hopefully not a defect). That said, I LOVE this product. 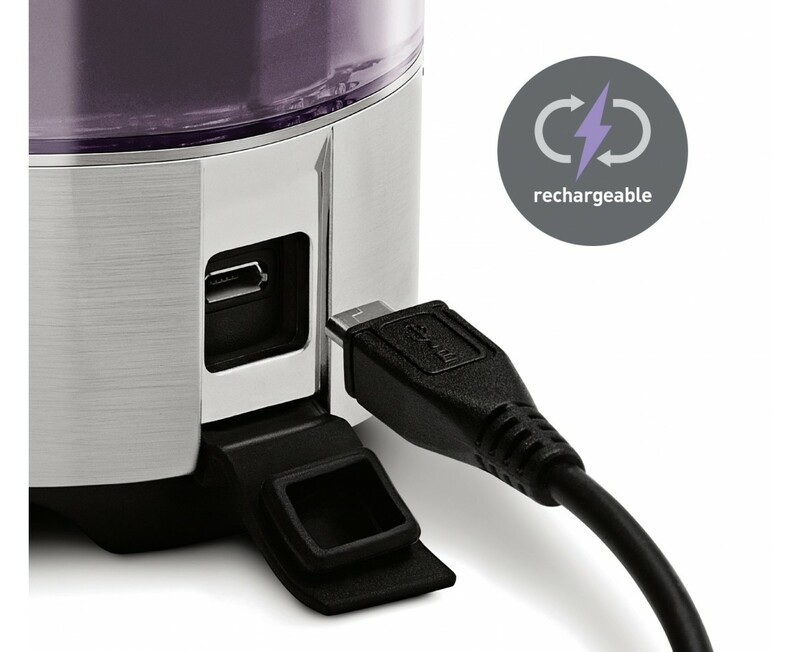 It is hands-free (great for public places), keeps a charge for months, and recharges through your computer with the usb cord provided in no time at all. The size of the "squirt" is adjustable -- a very useful feature. It´s perfect for the kitchen, which is where I have it. I´ll probably be getting another for the bathroom vanity. Love the finish. Love the way it worked for the first 6 months. Then clogged up. Cleaned nozzle per instructions and it then started leaking. Simple human replaced under warranty :-) but, from what I read in other reviews, this is a common problem. Haven't used the new one yet but have low expectations. The rechargeable sensor pump is an excellent product. It works well each and every time, doling out the correct amount of soap. I use it for both dishes and hands. It's very convenient during food prep because I wash my hands several times and I don't worry that I'm leaving "stuff" on the soap pump. Another great simplehuman product. We used the previous model of these pumps in our office. These new ones were such a great improvement we replaced all our old ones and added them to our home. The batteries last quite a long time and the overall design is much improved. If I could just keep customers from using the "+" button to activate it not knowing it is hands free. Love it! This pump hasn't actually transformed my life, but it has certainly led to improvements. It's just right in every way.The first one went in the kitchen for hand soap. The second went to my best friend. The third--the compact version--went in my bathroom. A fourth is on the horizon to dispense kitchen dish detergent. No more soap pumps tipping over, getting germy hands on the pump. This is just right for me in every way. I just love this sensor soap pump. It is the right size for the kitchen sink and it works so effortlessly. Great product. Excellent product, excellent quality. No messes, at all! Small, space saving, elegant design. So much better than plastic dispenser soap bottles. I liked my first pump so much that I bought two more. Excellent value for top of the line product. I don't provide reviews unless something blows my socks off. 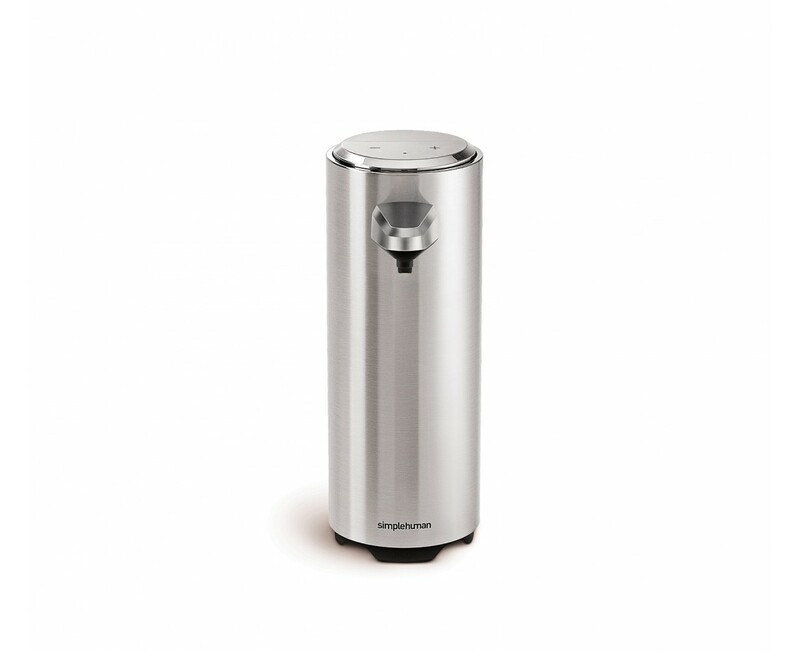 All Simplehuman products are exceptionally engineered and best of class. We own almost all of the Simplehuman sensor products including mirror, trash can, and others like squeege, etc... Why, because they are the finest engineered products out there. 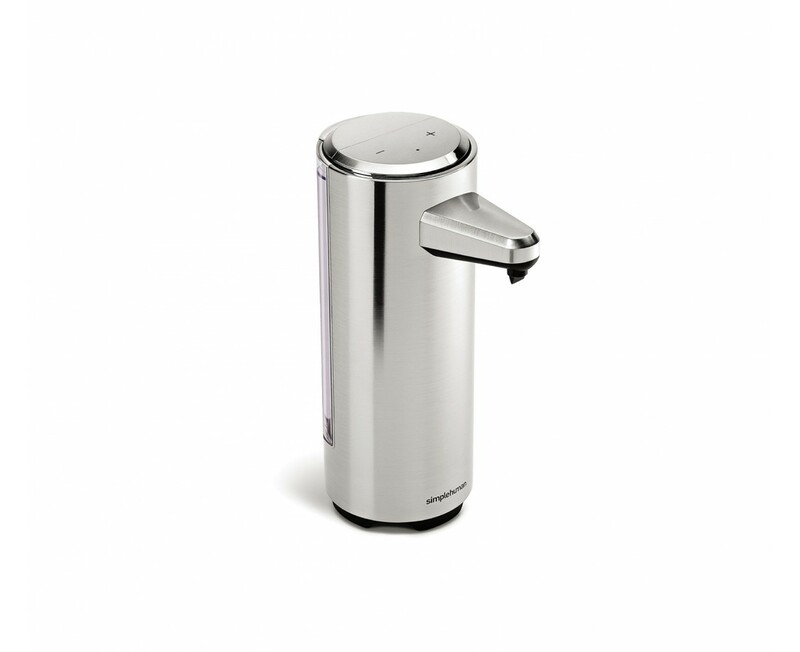 The small Soap sensor pump is beautifully designed and engineered. It is a stunning looking product that doesn't dribble soap. The see through back with the lavender soap is a stunning and beautiful design. We use these in our office. They are so much improved over their AA battery counterparts. We love that they are smaller and provide a much more accurate and reliable distribution of soap. The charge time is much better than the older models. Hopefully it will be the same after two or so years. Hand detection is also much better. Soap is a little pricy compared to the Sam's Club soap we could be using but it does seem to perform better in the pumps.